So after using the regimen for around 4 months, the redness and itchiness is really getting bad, especially a few inches under my eyes, which I don't even get the product near anymore. 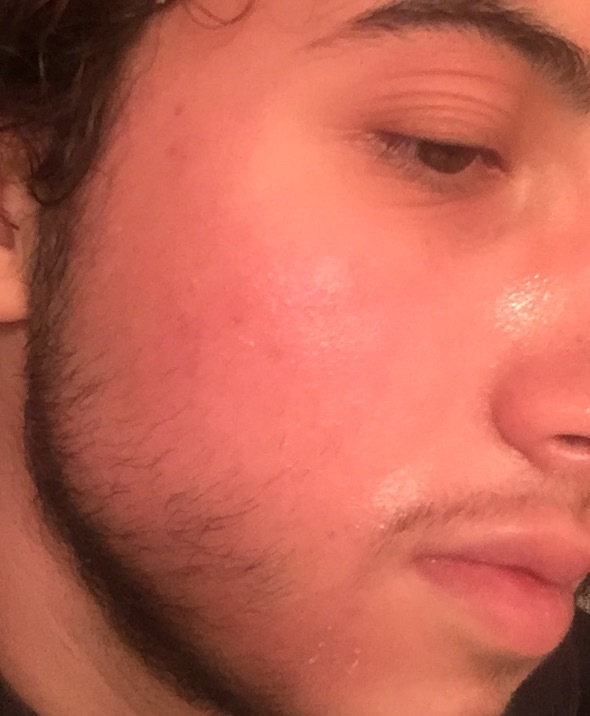 I put on the benzoyl peroxide near my cheeks and there is just painful burning at first and I get very red and it feels hot, and the redness subsides through out the day, and I'm not sure if I'm developing some sort of allergic reaction to benzoyl peroxide, or maybe dermatitis? I have some pictures to show, taken like half an hour after doing the regimen. You can see it's very red near my eyes, and I don't know why it's so bad there. I also have red dry patches on my chin. Even my eyelids and under my eyebrows looks red, and I have never gotten any product there! I have tried using less BP on my cheeks, but it still burns. I don't want to stop the regimen because it has cleared me up a lot. I have noticed I haven't broken out on my cheeks or anything in a while, just on my chin, so I might be growing out of my acne and I should taper off, but of course I'm scared of having cystic break outs again like I used to have before the regimen. 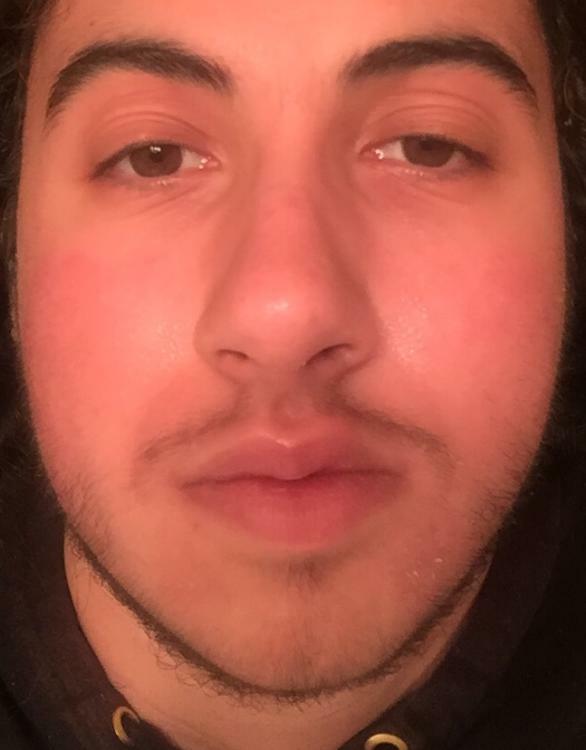 Does this look like an allergic reaction, or normal burning, or just using way too much? I'm using less than 2 full pumps, twice per day. If I use it once a day, I break out. I'm sorry to hear about your skin. Allergies to Benzoyl Peroxide are extremely rare. Symptoms may include severe swelling and crusting. What you are experiencing is irritation. Just to clarify, how much of the Acne.org Treatment ad Moisturizer are you using. Our best advice is that you stop using the Treatment temporarily until your skin goes back to normal. Once your skin is calm begin using all three products but start SLOWLY using only a very small pea sized amount of Acne.org Treatment only once per day for a full week. By week two you may start applying the pea sized amount twice a day. 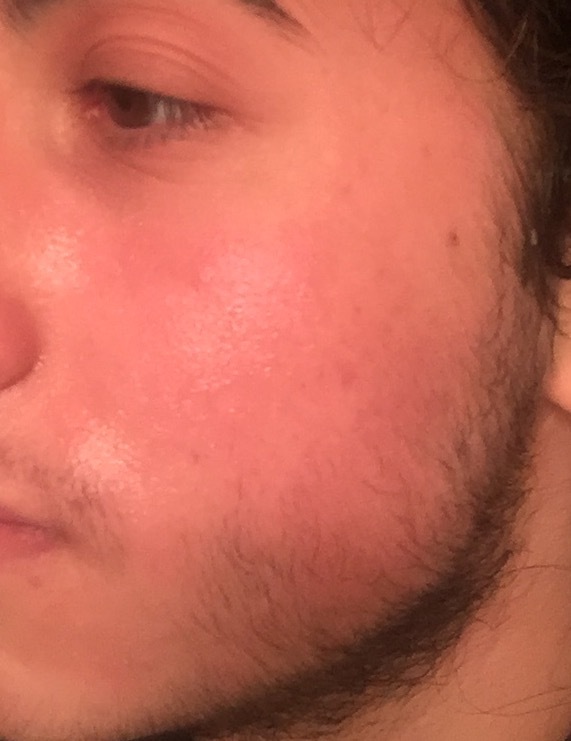 In week three you can begin increasing the dose SLOWLY and by the end of week four you should be using the full 4ML dose of Acne.org Treatment. Make sure that you use 2 full pumps of the Acne.org Moisturizer twice a day or as often as needed to help with the dryness and irritation.